Report: the leader of the Revolutionary Guards's elite forces met with Putin, Russian Defense Minister - despite UN travel ban. Iranian Revolutionary Guards leader Qassem Soleimani met with Russian officials last month, senior Western intelligence officials leaked to the press Friday, despite a travel ban from the UN. Soleimani met with Russian Defense Minister Sergei Shoigu and President Vladimir Putin on July 24, Fox News reported. Soleimani is the Iranian Revolutionary Guards commander who leads the elite Qods Force, which conducts foreign operations outside Iran's borders and directs the Islamic regime's terrorist activities throughout the world. He arrived on Air Iran flight #5130 at 6:50 a.m. for the meeting and left on flight #5120 the following Sunday (July 26), intelligence stated. It is unclear what transpired between the top terrorist and Russian leaders. Sanctions against Soleimani are due to be lifted in the event the Iran nuclear deal is implemented. Russia and Iran are close partners. The two countries have both backed the Syrian regime in the ongoing civil war; Moscow is also preparing to deliver S-300 missile defense systems to Tehran despite a chorus of international criticism. 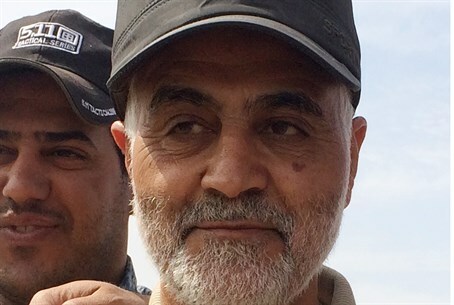 Soleimani was defined by the US as "leading the Iranian support for Syria in the violent suppression of human rights in Syria under (Bashar) Assad." In 2011, America leveled sanctions against him for his senior role in the Revolutionary Guards. Soleimani has also taken a direct role in fighting the US and killing American soldiers, having trained Shi'ite militias to fight against American forces in Iraq. In just one example from 2007, a unit of his Qods Force together with Hezbollah terrorists abducted and murdered four American soldiers in Iraq.